local guys quoted me €22 each case (+ postage/setup) so ordered one to see print quality. prices seem to vary enormously on 3dhubs, a couple quoted 2-3x this. thanks got meshlab and sketchup working, if the printer does a good job, I'll have a think about the design adaptations fr multiple boards and post them here if they work out. Ordered from a 3dhub in Brisbane. $34 which is cheaper than a laser cut from Ponoko. First 3dhub didn't get back to me. Changed to another one. 1) the front panel (panel with outputs, usb connection, etc.) should be 2 mm and in my design it is 3 mm, but all holes around front panel are for 2 mm design. So basically you need to make holes wider or to make front panel on 2 mm thick plate. 2) at the bottom plate there are 4 holes to support axoloti core. 2 holes are closer to front panel and their location is correct, but 2 others holes are not at correct location. This bugs are not critical, I spotted them quite late but I found workaround. This file is created in Inkscape and can be used directly in http://www.formulor.de/ shop. the hub was pretty good, the first print they found with ABS/100 was too brittle, and so they switched to a ABS/200 and used a different printer, a Prusa i3 PSIQUE. Both hubs I tried didn't get back to me so I'm going to give up on that. Love Aton's design so I'll fix it up and use Ponoko. 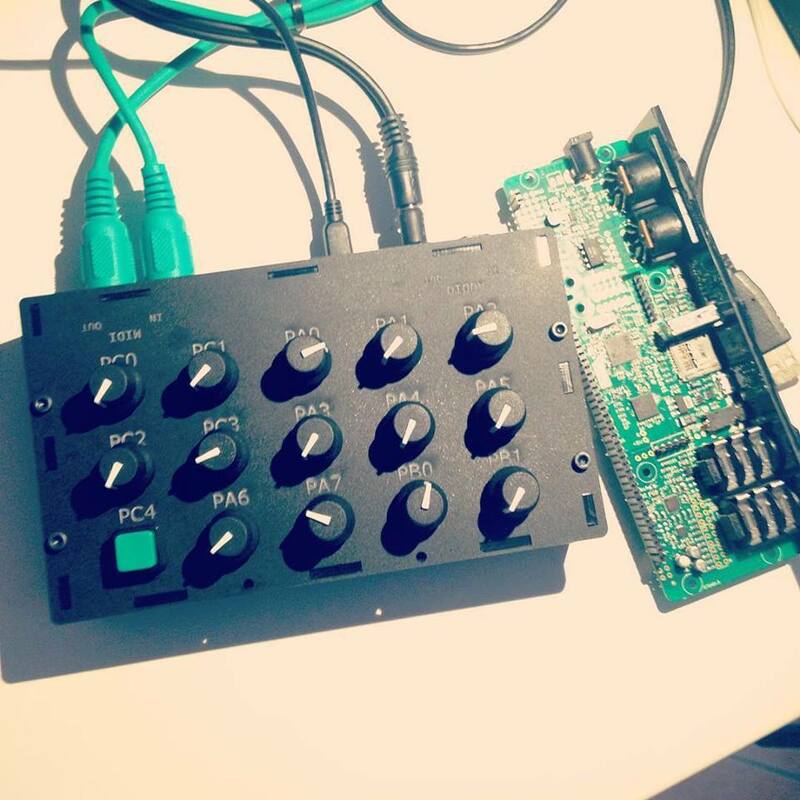 Can you tell us what encoders and knobs you used? 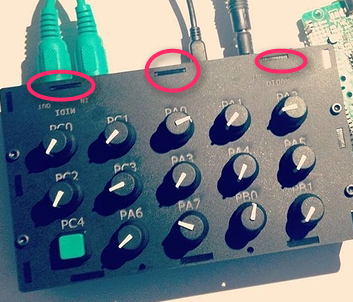 @Aton, when you say make the holes wider do you mean the midi, audio, usb holes etc? As in, if the plate is 3mm thick you can't get the plugs in? Thank you @thetechnobear for this useful report! Yes, the structures are quite fine, thus the printer should be a good one. The slicer software, too. Optimum nozzle diameter is 0.4 mm. Deformations ("warping") often come from uneven shrinking, and some materials deform more, some less. PLA may be better than ABS here. I found a few bugs in the design but which are not serious; I didn't notice them easily. And I have a few improvement ideas, to have it snap in more firmly, to save material and print time, and to hopefully reduce the risk of warping. But it will still need the same printer accuracy. An update will come. It should be feasible to create a new design for lower precision printers, starting with copying the relevant dimensions from mine. Maybe someone else would want to? What would you consider a 'higher quality printer'? ... and does something like the Ultimaker2 use 0.4mm nozzle? my fear, is that its not just the printer though... is it possible that the hub doesn't have the printer setup in an optimal way, or calibration is not as tight as it needs to be? this would be hard for me to know in advance. deformation, it didnt seem warped... more like things were a few mills out... e.g. 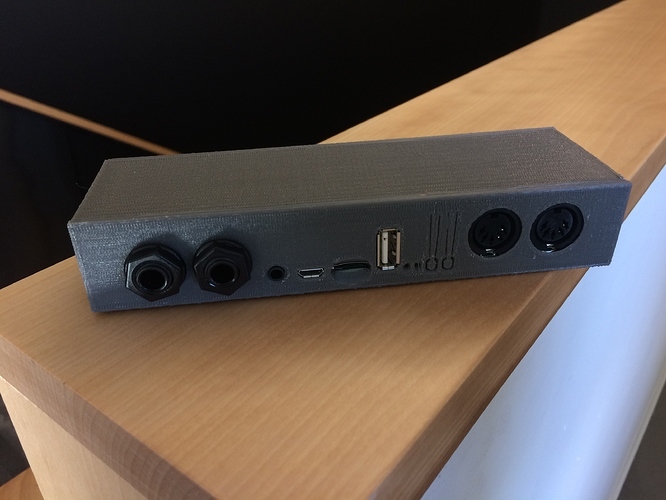 if inserted the front over the audio jacks, then the usb host port was about a 1mm out, and the midi ports about 2mm off ... almost like the thing had perhaps 'shrunk'. also I noticed the 'indentations' front side of the faceplate were not well formed. yeah, I think a lower precision design would be possible, in particular the sidewalls would have to be quite a bit thicker. or perhaps have side walls separate, so it becomes a 6 part structure. 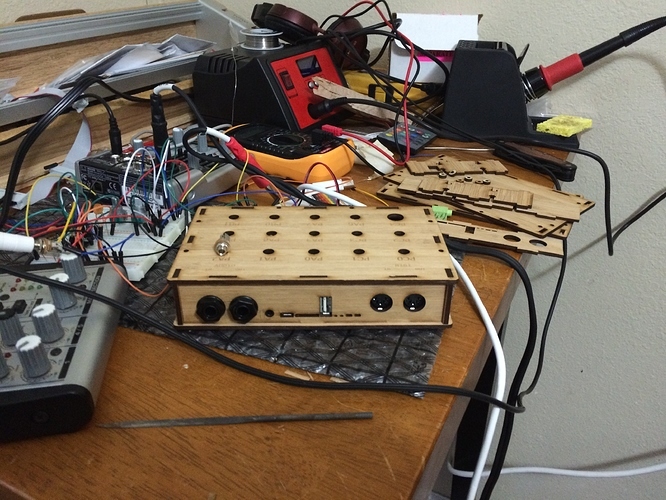 and the audio outputs could be much bigger (to allow for tolerance) since they are 'covered' by the screw on cap. possibly other outlets could be slightly larger too, not as tidy, but more room for manoeuvre. Id actually quite like a sliding lid, and a way to get the board out a little easier.. useful if you want to connect io pins etc. What you describe seems to be considerable shrinking indeed. Yes, Ultimaker printers have a 0.4mm nozzle. I think you're right, just saying "find someone with an [Ultimaker or whichever]" is not sufficient to get a good result for sure. Experience with the machine and the software settings, and careful practice are always necessary, unlike with 2D printers, unfortunately. Not to discourage you, but designing without being able to test at home would be a bit difficult. You are just seeing how much / how little my experience that relates to my own printer can be used to predict printability on another printer. For me 3mm thick plate works ok with my usb, midi and audio cabels. Great, thanks. I'll knock up a Ponoko file with a full 3mm enclosure. I used @Jens_Groh layout to do a test print with 3dhubs.com. The case looks great and fits perfect. The only thing i would change is the thickness (sturdiness) of the case. Maybe it needs some more supporting beams on the top and bottom. New Sketchup design files here. The trick to prevent warping is, to make the parts hollow. I doubled their thickness, but the print software should be set to make a thin shell. About 0.5mm shell and top/bottom thickness, 30% fill percentage and 0.1mm layer thickness (optionally 0.2mm for first layer) should work. @aton thanks for your design I had it cut at Ponoko, in bamboo! It rocks! The holes on the top are actually the perfect size for the 1/8th mono jacks I'm planning on using. The bamboo was very easy to trim the panel to fix the bug works great! I don't know a thing about 3D printing but my local library has a printer I can use for almost free. Do I just download an stl file an take it with me on a USB stick or what? Also; how long does it take to print this case? They have two printers: Ultimaker and miniFactory, if that makes a difference. Well, there is something to learn before. And every printer type is different. Best you find someone who knows the printer and bring the STL files. The raw machine control data (GCODE file) need to be prepared with a ("slicing") software that knows the machine properties. You can do that at home. For Ultimaker, you will probably want to use the Cura software, it's free. With that gcode file on a SD memory card you can directly print on an Ultimaker. Maybe you need to bring your material. I'd recommend PLA material. My print took 6 or 7 hours for all parts together, in very fine resolution. Printed on the Makerbot Replicator 2. Went well, 2 of the little platic tabs broke on the DC connector side but I noticed the DC jack is soldered crooked so it must be that. Still closes firmly. Thanks for the files !